A while back I reviewed the Dolgen Inspira mini composition book. I have quite a few books like this and instead of reviewing them all I decided to just compare them all together. So here’s the mini composition showdown. Mead vs. Inspira vs. Top Flight. First off, covers and binding. All the covers are the standard composition marble pattern, with the Inspira being the most crowded followed by the Mead and then the Top Flight. The binding on the Top Flight is a sturdy fold stitch with eight signatures, while the Mead and Inspira are weak, simple glue binding. All notebooks lie flay fairly well, though the Top Flight takes more breaking in. Cover durability again goes to the Top Flight with the other two tied. The cover corners are straight on some of the Mead, clipped on the Top Flight, and rounded on the Inspira, meaning the Mead with the square corners will most likely tear up quickest. Other Mead notebooks have rounded corners. If you want color the Mead and the Top Flight are the way to go. Their dimensions are about the same, with Inspira being slightly taller and Mead being slightly wider. The Mead and Top Flight both have eighty pages, while the thinner Inspira has sixty. The smoothest paper belongs to the Mead, the roughest to the Inspira, and the Top Flight is very akin to newsprint, unfortunately, not very high quality. All are not archival quality paper and fade rather quickly on the shelf, though they are bright white out of the package. None are very good at holding ink, but the Inspira is best without bleeding, followed by Mead and Top Flight. What will really make or break these books, though, is their large price difference. The Inspira are three for one dollar (U.S.) the Top Flight are five for three dollars, and the Mead are one to two apiece. So if you can organize all that and determine the best for you you’ll end up with a very nice pocket book. Each one is suited subtly to a different task so the main challenge is finding out what is best for you. They are certainly not the best memo books by any means, but they’ll certainly work, especially in a pinch. 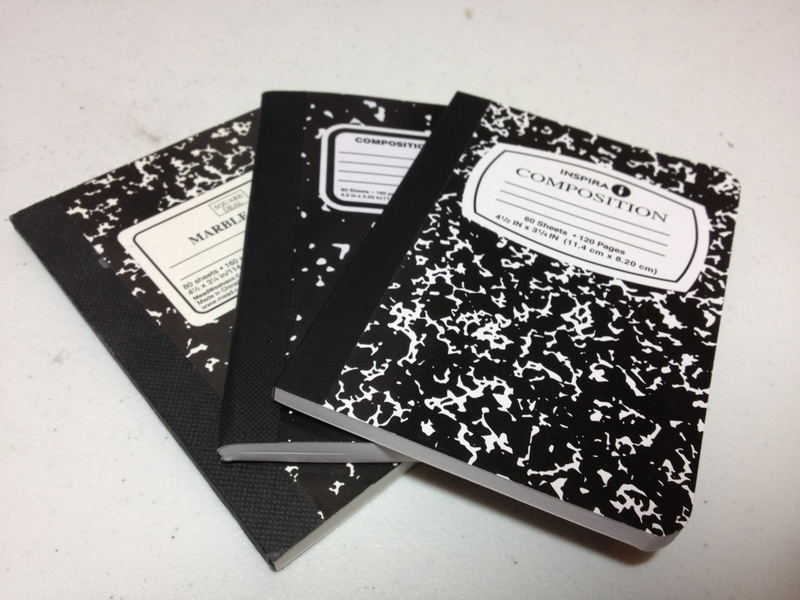 This entry was posted in Beginner Supplies, Surfaces and tagged cheap, composition, lined, mini, notebooks, notes, pocket books, review, small by Dragon Co (Austin Smith). Bookmark the permalink.